A javelin is a light spear designed to be thrown. Historically it was a weapon, but from the Ancient Greeks to today it was used for sport. The javelin is almost always thrown by hand. The javelin throw is a sports event, one of the field events which survive from the original Olympic Games. 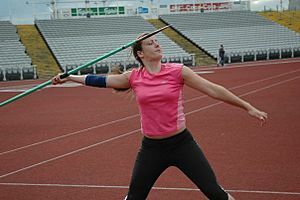 The athlete holds the javelin in one arm and, while running, throws it as far as possible. It is an official Olympic sport. Unlike other throwing events, javelin allows the competitor to build speed over a considerable distance. As a result, a javelin can reach speeds approaching 113 km/h and to cover the distance of 104.80 m.
Javelin Facts for Kids. Kiddle Encyclopedia.